Dillwyn -- Convicted murderer Jens Soering is hoping DNA evidence is his ticket out of prison. Soering, who is serving a double life sentence for the 1985 murders of Derek and Nancy Haysom in Bedford County, spoke Friday with News7’s Keith Humphry at the Buckingham Correctional Center in Dilwyn. He claims that since there isn’t any conclusive DNA evidence of his from the scene, it raises doubt about his involvement. Reasonable doubt is the standard a jury applies to evidence at trial. “You look at the fact that they recovered 42 samples and none of them can be linked to me, then you’re going to say to yourself, ‘Wow, that's not proof but it is reasonable doubt,’” Soering said. For the hour-long interview Soering wore eye glasses, a wristwatch, brown boots, and prison-issued blue shirt and blue jeans. Soering, now 44 years old, expressed a range of emotions from profound and remorseful to spiritual and agitated. Throughout the interview he proclaimed his innocence. Soering almost didn’t have to rely on DNA evidence for his freedom. Former Governor Tim Kaine agreed to Soering’s deportation back to Germany in 2009. However, current Governor Bob McDonnell rescinded that decision. 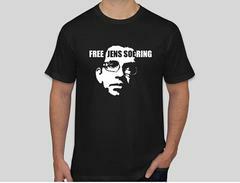 Now, Soering believes a conditional pardon is what he deserves. He also accepted accountability for helping Elizabeth Haysom, the victims’ daughter and his former girlfriend, cover up the crime. Also, he says Elizabeth Haysom committed the murders, but she shouldn’t be held entirely accountable because of her mental state. Without going into detail, Soering revealed that he’s lost touch with his father, a former German diplomat. He also said his mother died in 1997, and that he recently got back in touch with his great aunt. Soering pointed out that since he’s been incarcerated, he has never been issued an institutional infraction. For more on this story, watch News7 at 6 Monday for a follow up on the interview.